Whether you intend to embark on a career in politics or not, at Christleton we would still urge you to follow the advice of Winston Churchill! 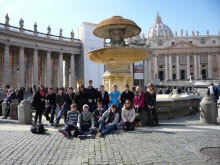 At CHS, History is a thriving and exciting subject where students are encouraged to aim high and fulfil their potential. Through the study of a wide range of historical periods, we develop students’ skills of historical enquiry, source analysis, development of argument and written communication. The personal development of our students is at the forefront of their learning as we also encourage students to ‘build their learning power’ and develop their skills in Resourcefulness, Reciprocity, Resilience and Reflection. At Key Stage 3, students will study a variety of topics such as, Slavery, Medieval England, The Holocaust and The Second World War. We also develop students’ awareness of local history with a study relating to the fallen soldiers of Christleton from World War One. There is no such thing as a typical history lesson - activities can vary from writing a song, to demonstrating an understanding of ‘interpretation’, to building a Holocaust memorial and through the use of homework projects we actively encourage our students to develop skills of independent learning. From 2016 onwards, GCSE, students will follow the Edexcel Syllabus which involves the study of Superpower Relations 1941-1991, Russia 1917-1941, Medicine through time from 1250 (including a study of surgery and treatment on the Western Front from 1914-1918) and Early Elizabethan England from 1558 - 1588. We believe that History should be experienced both inside and outside the classroom and so are involved with a variety of extra-curricular activities. 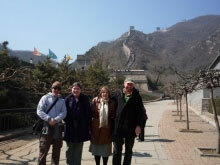 In recent years our students have been on visits to Ypres, Rome, Berlin and even China in the past! In addition to this, students at Christleton will also have the option to study Classical Civilisation at GCSE as an extra-curricular subject. Classical Civilisation involves the study of two Roman history units and two Greek history units. The areas of study are Emperor Nero, Pompeii and Herculaneum, Homers ‘Odyssey’ and Euripides ‘Medea’. Classical Civilisation has proven to be hugely popular with our students and can provide some new and diverse challenges to our Key stage 4 students. Why was Russia ripe for Revolution in 1917? HOW do the two interpretations differ? WHY do the two interpretations differ?